Categories: Adult Adoptees, Books for Adoptees, Classic Adoption Books, Tapestry Picks. As an adoptee, do you have mixed feelings about your adoption? 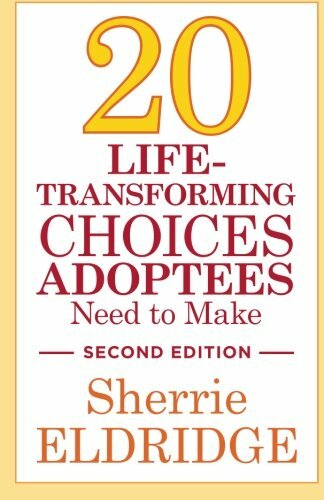 Sherrie Eldridge is an adoptee and adoption expert, and in this book she draws on her personal experiences and feelings relating to adoption as well as interviews with over 70 adoptees. Sherrie reveals how you can discover your own unique life purpose and worth, and sets out 20 life-transforming choices which you have the power to make. The choices will help you discover answers about issues such as: Why do I feel guilty when I think about my birth parents? Why can’t I talk about the painful aspects of adoption? Where can I gain an unshakable sense of self-esteem? Sherrie also addresses the problem of depression among adoptees and common dilemmas such as if, when and how to contact a birth mother or father. This fully updated second edition includes new material on finding support online, contacting family through social media, and features three new chapters, including Sherrie’s story of reuniting with her birth brother, Jon, in adulthood.